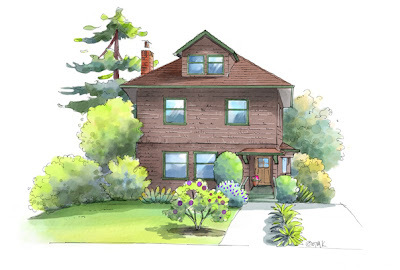 What is a Craftsman House? American craftsman homes were popular roughly from 1909 thru the 1930's. Craftsman homes reject the ornate elegance of the high Victorian Style of previous years. Instead craftsman homes express a simpler, back to nature look that emphasizes earth tone colors. Built in towns all over America, craftsman's are warm and inviting. With stained wood trim, stone and slate these homes often boast built-ins such as window seats, benches and bookcases. A person could walk in a craftsman home that is unfurnished and feel as if it were ready to be lived in. Are you craving a craftsman? Come visit me at 526 Mira Vista Avenue in the Grand Lake District of Oakland. I will be open this Saturday from 2-5 pm. This home is a 4+ bedroom/2+bathroom home walking distance to the Grand Lake Theatre, the Farmer's Market, DiBartolo, Arzimendi, the Grand Lake Rose Garden and More! I am not the listing agent of this property, but I am familar with this home and neighborhood. Feel free to email me your questions.